EVEN MORE P-90® AGGRESSION WITH A SINGLE COIL BITE. The Steel Pole 43 Single Coil Pickup is again, one of our most popular pickups. This model is built with the same specifications as out Steel Pole 42, but with 43-gauge wire and 5% more turns. This pickup leans more to the tone of a P-90® than a single-coil. It is perfect for musicians looking for a thick, warm, and beefy P-90® sound in a single coil position. Steel Pole 43’s are wound with 43-gauge coil, and feature a ceramic bar magnet that blends the P-90® and single-coil sound perfectly. This pickup is beefier than the Blues Specials and Steel Pole 42‘s, while featuring a darker and thicker tone. When playing clean, Steel Pole 43’s sound large and rich, especially in the lows and highs. Closer to the sound of a P-90®, these pickups still retain a beautiful openness and clarity while still remaining very dynamic. Steel Pole 43’s sound thicker in the midrange with more of a “chainsaw” grind, as opposed to a smoother AlNiCo distortion. Hand wound with 43 gauge Heavy Formvar wire, a Ceramic Bar Magnet and cloth leads. We recommend using either 250K pots or 500K pots depending on the tone the user desires. 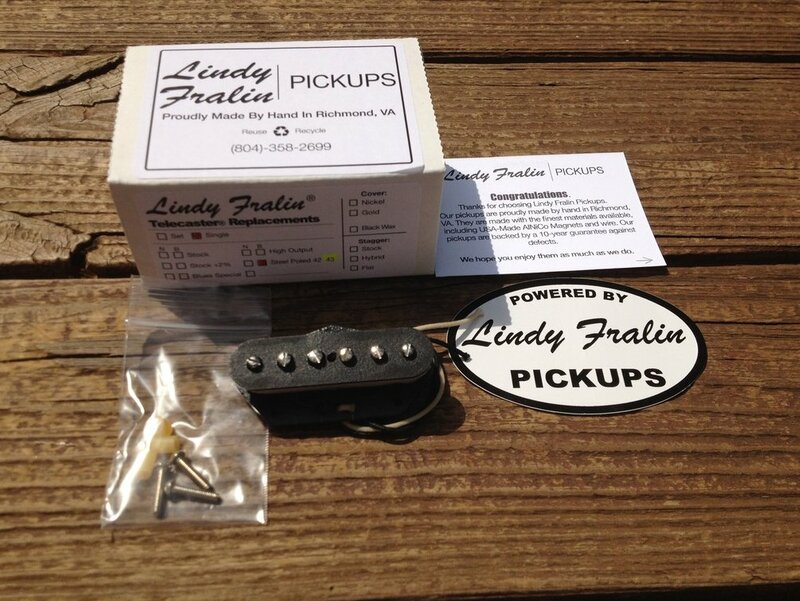 At Lindy Fralin Pickups, we always use USA-Made Wire and Magnets.